Gretchen Zierick and her father Russell pause during a walk through the firm’s plating department. “I’ve worked in nearly every area of the business at one time or another,” says Gretchen, “including spending several months running the plating department.” The department is critical to Zierick Manufacturing’s competitiveness: “We’re known for producing plated electrical components with excellent solderability,” says Gretchen. will be felt by the entire industry, as she takes the reins of PMA. She’s eager to share her ideas, wisdom and enthusiasm from the association’s seat at the head of the PMA table. Gretchen has served as president of electronics-industry supplier Zierick Manufacturing, Mount Kisco, NY, for the last 10 years; the company has been a PMA member since 1985. “I love the metalforming processes work and making sure that they work correctly, knowing that we’re doing things correctly,” Zierick says when asked from where she gets her passion and drive that has kept her company at the front of the pack of electronics-components suppliers. “At Zierick Manufacturing, we have an R & D team that works to understand customer and industry problems and then develops unique patented products.” For the next year, Zierick will work o instill that philosophy at PMA, one of new ideas and new opportunities. All the while, she urges all who work in our industry to unite in support of her theme for the year: The Morality of Manufacturing. What is it that manufacturing companies do right? Zierick reminds us that those who work in manufacturing use their minds to create products from ideas, all in the context of earning enough profit to support their employees and drive the economy. 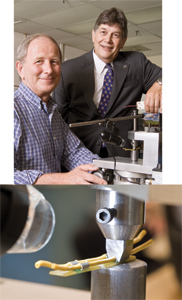 Design and development of patentable electronics components is the lifeblood of the company says Zierick, and that responsibility falls squarely on the shoulders of Janos Legrady (seated), vice president of research and development, and Frank Lynster, vice president of engineering. Its latest development, shown here, is a surface-mount insulation-piercing crimp terminal, and the Zierick press and tooling that quickly terminates a wire to surface-mount printed-circuit boards. The product earned Zierick the 2009 Higgins-Caditz Design Award from PMA. Strengthening the Foothold in Washington, D.C.
Zierick’s theme dovetails well to PMA’s long-term commitment to lobbying our nation’s politicians, to make them understand the impact that their legislation has on our industry and its ability to compete in the global market. Manufacturing creates wealth and jobs, and PMA supports legislators that understand these principles as proven by their support of pro-manufacturing policies. 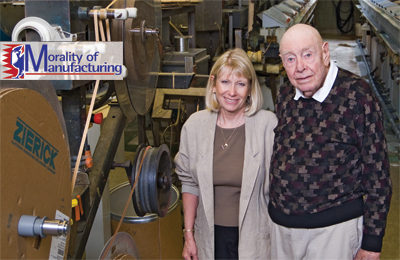 As part of her theme, Zierick urges all that work in manufacturing to follow PMA’s lead and support those politicians that support policies that encourage the growth of America’s small- to medium-sized manufacturing companies, by eliminating barriers to profitability. During her term as PMA Chair and beyond, Zierick expects PMA’s advocacy efforts to help ensure that government actions do not put manufacturers at a further competitive disadvantage. Of immediate concern: burdensome tax hikes, labor-law reform and cap-and-trade legislation. PMA, thanks to its ongoing and developing One Voice advocacy program in partnership with the National Tooling and Machining Association (NTMA), will continue to work tirelessly on Capitol Hill. One example of the two associations working together toward a common goal was the first annual One Voice Legislative Conference, attended by nearly 100 NTMA and PMA members (including Zierick) in Washington, D.C. on May 12-13, 2009. Participants heard presentations from several members of Congress, and then spent a full day on Capitol Hill lobbying more than 100 congressional offices on a variety of issues, including cap and trade, card check, taxes, health care, currency manipulation, the auto industry and workforce training. In addition to advocacy, Zierick also believes PMA, through the PMA Educational Foundation (PMAEF) offers the industry a powerful platform from which it meets the continuing and evolving educational needs of our industry. A 7-yr. member of the PMAEF board of trustees and past chair, Zierick helped the foundation create PMA University in 2007, near the end of her 2-yr. term as chair. And, she testifies as to the value of some of the foundation’s training tools. Featured at the 45,000-sq.-ft. home of Zierick Manufacturing is a pressroom filled with 15 high-speed stamping lines equipped with Bruderer and Minster presses to 60-ton capacity. 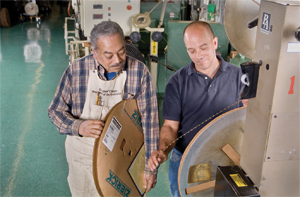 Here, toolmaker Luis Sanchez (left) confers with Jim Barra, production supervisor, on the quality of the stamped electronic components coming off of one of the lines. Typical dimensional tolerances are ±0.005 in. training tool from PMAEF is the video-based series called Economics…Making Dollars & Sense,” Zierick says. This set of three lessons is designed for existing and new employees in metalforming plants to help them understand the economic choices involved in the operation of their company, and the role of the employees in making those choices. PMA University started as a package of training and education resources and has grown larger with new Internet-based opportunities. This year, PMAEF rolled out a new Technical Training Library consisting of webinars and a series of PowerPoint presentations on traditional seminar topics. “Our company participates in nearly every PMA webinar,” says Zierick, “and we typically have a group of people interested in each topic, so the programs have proved to be extremely cost-effective. “We also participate in the Educational Foundation’s annual Best Practices Workshops,” Zierick continues. “These workshops feature PMA district leaders and their local educators coming together to share what they are doing locally to meet the training needs of metalforming companies.